Military backpack is made from highly durable, military-grade 600D polyester material abrasion-resistant ,scratch-resistant, not easy to fade,add the advanced high cushion back pad and shoulder straps allow for breath ability and impact reduction it will be more comfortable.and features a range of compartments ensuring you're never short on space. Tactical backpack size: 14.5" x 21" x 8",Capacity:39L-60L . Weight: 3.6 lbs.main area which expands from 5 to 10 to fit more training gear,two accessory pockets,a water bottle mesh pocket,two electronics pockets on shoulder straps removable waist belt daisy chain holds gear to fit more training gear. backpack bundle band can keep the backpack from deforming,make your backpack more beautiful. Military backpack the side parachute buckles allow for tightening to provide a compact, easy to transport pack. the smaller pocket on the rear contains an organizer pocket inside. it has a laptop pouch (17" x 11.5") directly behind the back padding. it can also carry a hydration bladder (bladder not included) inside the main compartment and has a hydration port .that it can meet your demands in daily life and outdoor camping. 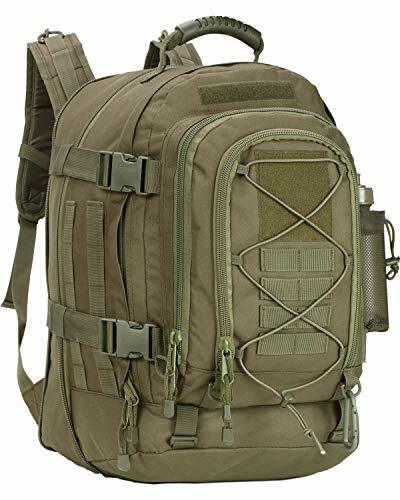 Multiple uses backpack Works great as a hunting backpack，hiking rucksack, 3 day assault pack，range bag or everyday travel bag, but is equally suited for use by the military, police cadets, army, navy, etc. who need a strong and reliable assault backpack to use on their training operations when in the field. If you have any problem, please contact us, XWLSPORT will try our best to help you. Innovation is the main concept of our XWLSPORT brand. we are committed to providing our consumer with high quality and cost-effective backpack, which aims to make the consumers really feel the charm of the product itself. This expandable tactical backpack is constructed with high quality 600D polyester material, heavy oversized zippers and tabs. expandable main compartment with multiple gear pouches and Molle compatibility that allows customizing the pack for your needs. main compartment expands an additional 5″ to accommodate extra vital assault gear to complete your mission. main compartment expands from 39 liters to 64 liters . main area expands from 5″ to 10″ to fit more gear.